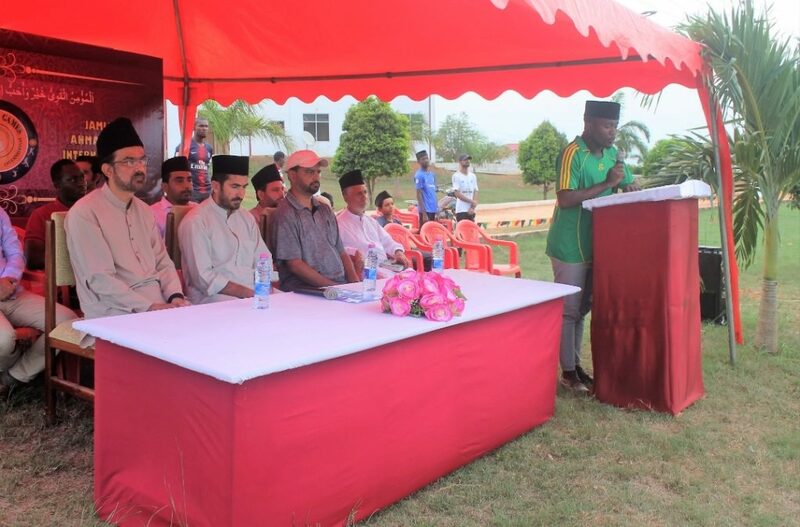 On Saturday 23 March, Jamia Ahmadiyya Ghana celebrated the Promised Messiah Day. This programme was held by the Majlis-e-Irshad and was attended by all staff members and students. During the programme, lectures were delivered in Urdu, Arabic and English about the blessed life of the Promised Messiah, Hazrat Mirza Ghulam Ahmadas. Likewise, poems of the Promised Messiahas were recited and a local poem was also sung, which explained the blessed life of the Promised Messiahas. During the Jalsa, Liwa-e-Ahmadiyyat was also hoisted. During the event, Muhammed Naseerullah Sahib made an introductory presentation about flag of Ahmadiyyat, its history and the protocol regarding its hoisting. He also repeated the pledge which was recited by Hazrat Musleh-e-Maudra during the first hoisting of Liwa-e-Ahmadiyyat on 28 December 1939. The first speech was delivered in English by Abdul Hameed Ismael Sahib on The Promised Messiah’sas Love of the Holy Quran. The next speech was in Arabic by Fahad Muhammed Alghazo Sahib, lecturer at Jamia Ahmadiyya on The Life of the Promised Messiahas followed by an Urdu speech by Sajid Mahmood Butter Sahib, a lecturer, on The effect of the writings and discourses of the Promised Messiahas. Towards the end, the chairman, Mirza Khalil Baig Sahib, spoke on The Importance of the Promised Messiah Day. The live translation of the Hazrat Khalifatul Masih’saa Friday Sermon has commenced from the Wahab Adam studios into Twi and Yoruba, local languages of Ghana and Nigeria respectively. These translations began broadcast on MTA Africa starting from 15 March 2019. Before this, there had been lots of work going on at different stages concerning the preparation for a live translation. For this, four students of Jamia Ahmadiyya, each of Ghanaian and Nigerian origin, travel to the Wahab Adam studios at Bustan-e-Ahmad, Accra every Friday to translate Huzoor’s sermon live from Urdu. On 26 December 1905, whilst advising the missionaries of the Jamaat, the Promised Messiahas drew their attention towards acquiring worldly knowledge along with religious knowledge. He also expressed the desire that a day be set aside in a week during which students of the college be taught by way of lectures. In these lectures, they should be taught teachings of the Holy Quran and various other subjects, and likewise, responses to the objections levelled against Islam. This directive of the Promised Messiahas has been implemented for the past five years in Jamia Ahmadiyya International – Alhamdolillah. Every Saturday, instead of regular studies, students are taught answers to various allegations against Islam and Ahmadiyyat. In this regard, as per the directives of Hazrat Amirul Momineenaa, every Sunday students receive questions through a GTV helpline provided and during the week, their answers are prepared and delivered to the callers on phone. These very answers are then shared with the students on Saturdays so that their knowledge may increase and that they may be prepared for future responsibilities. In accordance with Jamia’s calendar, this year’s annual games were held on 27-30 March. 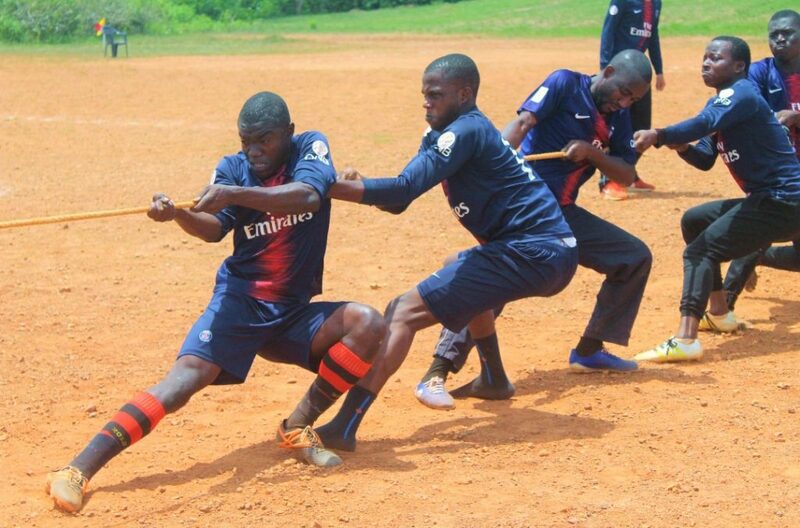 Aside from daily exercises and jogging, competitions consisting of football, volleyball, table tennis, taekwondo, body-building and cycling were held. In addition, during the year, cross-country race, swift walk, tug of peace, meeru dabba and relay race competitions were held. For the group competitions, students were divided equally into four different groups. During the annual games, all final matches were played together with other games like sabit qadmi, shotput, discus throw, wrist wrestling, long jump, 100 metre race, 400 metre race, observation test, catapult shooting, arm wrestling and obstacle race. The opening ceremony for the games was held on 27 March. After the recitation of the Holy Quran and the issuing of directives, the special guest in the person of Syed Nematullah Sahib commenced the games with a silent prayer. During the last day of the games, the special guest for the day was Ahmad Suleiman Anderson Sahib (Naib Ameer III, Ghana). After recitation from the Holy Quran, a poem and a presentation of the annual sports report, the special guest distributed prizes, after which the principal of Jamia, Fareed Ahmad Naveed Sahib, also presented gifts to some invited guests. On 7 March, under Majlis-e-Ilmi department, a competition was held on the sermons of Hazrat Khalifatul Masihaa. Another competition for memorisation of prayers was held on 14 March. On Thursday 21 March, a religious quiz programme was held. On 2, 9 and 16 March, the MTA Ghana crew came to Jamia Ahmadiyya for regular recordings. During March, a total of 25 programmes were recorded. The subject of these programmes is based on the teachings of the Holy Quran, the blessed life of the Holy Prophetsa, matters of jurisprudence and the history of Ahmadiyyat. The programmes were recorded in English, Twi and Hausa. So far, programmes have been serialised and 269 programmes have been recorded. 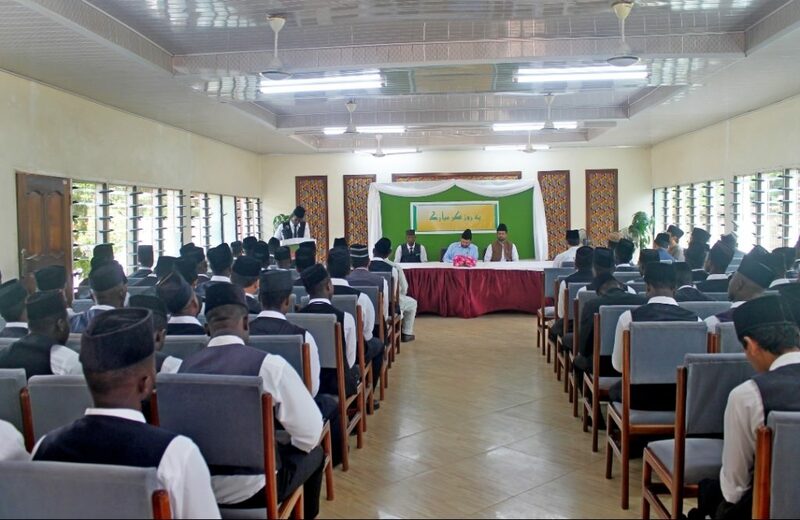 Questions received as a result of a Jamaat’s programme broadcast on two Ghanaian TV channels – GTV and CINE PLUS – were answered through phone calls by a panel of students under the supervision of teachers. Most callers expressed emotions of happiness and satisfaction. A total of 114 individuals have joined Islam Ahmadiyyat through this programme. In Jamia Ahmadiyya International, under the department of sports and in the supervision of their teachers, students go through exercise and jogging after which they join any sports of their choice which lasts for an hour. Aside from daily sports, football and volleyball matches are organised for students with neighbouring Ahmadi and non-Ahmadi friends. Every year the final year students are provided with a special suit for their convocation. According to this tradition of Jamia Ahmadiyya International, during the month, new uniforms were prepared for the 14 final year students for the coming convocation ceremony on 23 June 2019.